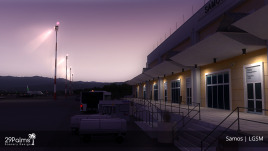 Scenery of Samos International Airport [LGSM] in Greece. 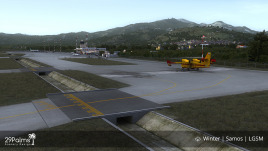 Compatible with Microsoft's Flight Simulator X, Lockheed Martin's Prepar3D v3 and v4. 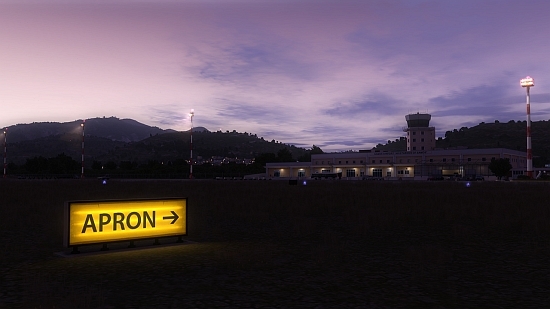 The most challenging approach in all of Greece! 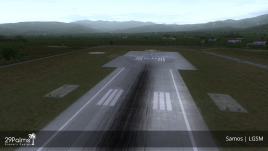 Are you ready to test your piloting skills? 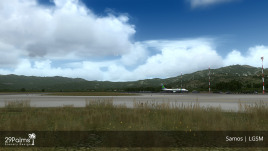 Samos is the island airport with the most notorious landing approaches in Greece. 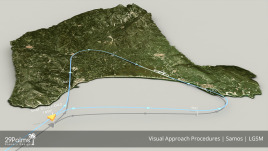 It involves pure “stick n’ rudder” demanding hand-type of flying in between mountains, without navigation instruments guidance, moderate or higher turbulence due to terrain, the FIR border just on the airport’s pattern and tight turns short before lining up for last stage of final approach to land. 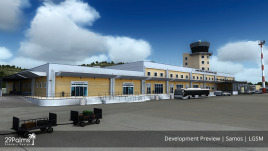 These are only a few of the reasons why we have decided that this challenging and interesting airport would be the perfect addition to our Greek island series following Mykonos and Skiathos. 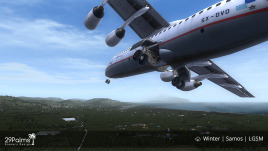 This scenery depicts every aspect of its real counterpart in great detail using the latest techniques of flight simulation development. 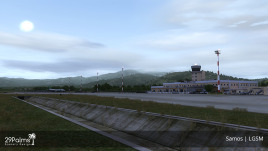 Are you ready to test your piloting skills? Let the journey begin! 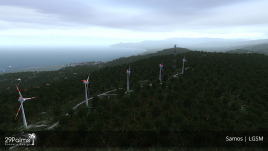 Extensive landclass and vector upgrades for Samos, neighbouring islands and the turkish coast. 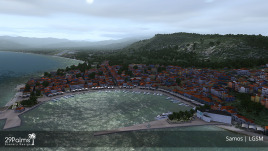 If you are looking for beautiful textures – Samos has them. Small objects scattered around the airport – plenty of them here. Nice terminal models – checked. 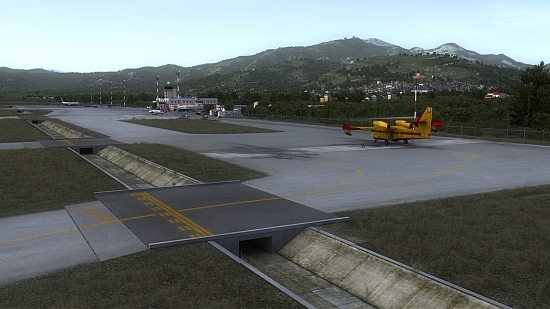 Static aircraft, suitable for the location – checked. You can even choose the ones included. Animated people – many. 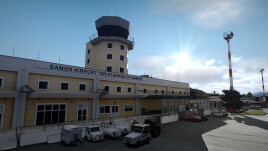 Airport fence does not limit scenery’s coverage – surrounding towns reflect the unique character of a Greek island. All of that makes Samos a superb scenery. And an interesting airport! Absolutely amazing scenery; Beautiful modelling and texturing, huge number of configuration options, great performance, just a work art. 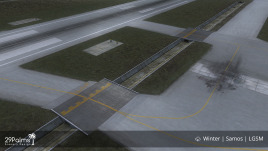 I'm pleased that not the entire island was covered with a photo texture, that is not necessary for airliner flying if ORBX FTX Global, OpenLC EU and Vector are used. 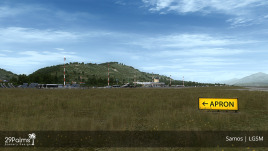 Speaking of ORBX: The scenery can optionally be colour-matched to FTX Global! This is highly appreciated and there are still too many other developers out there without this option. 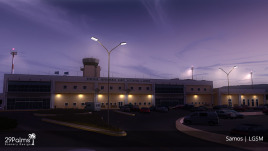 Excellent rendition of the airport and the surrounding area as always from 29Palms. It' a must have if you're flying to south Europe. 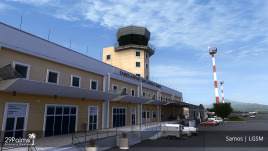 I cannot wait for all of 29Palm's airport to be release for X-plane so I can have the quality (moved there finally). 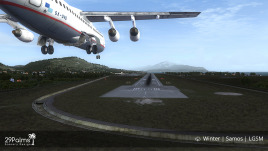 "I have never been so immersed with a product within Flight Sim outside of an aircraft. 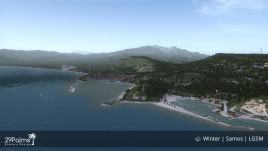 I am constantly finding new things to love about Samos, and I’m sure you will do too. 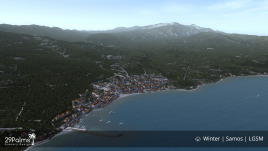 With a reasonable price, challenging approach and a host of features, Samos needs to be in your scenery library and will remain there for years to come." This is my first scenery from 29Palms and I am totally shocked how excellent this scenery is worked out. 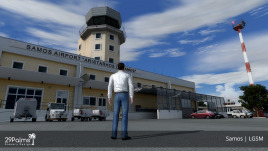 The performance is perfect and there are no VAS problems even if you fly in from a heavy airport like the Aerosoft Frankfurt 2. 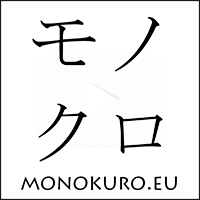 Note: Lets have a look how updating will be but the plan is very promising. 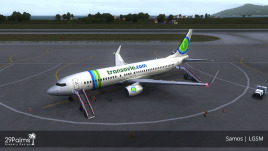 This Addon is awesome and it is a absolutly must-have. 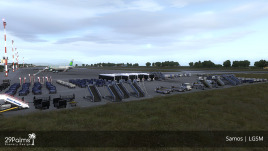 The airport is very challenging and you have to show all your skills for a good landing especially when you have a weather tool like FSGRW too. 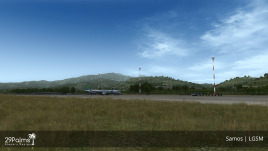 But this scenery isn't only for people who fly even for people who want to discover things with the avatar. FANTASTIC work ! I can only look forward to other masterpieces. 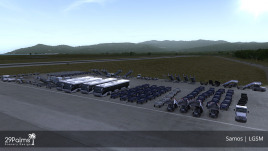 Everything that a simmer could possibly ask for in terms of simulation relevant eye candy, with options to add even a touch more than one would need. 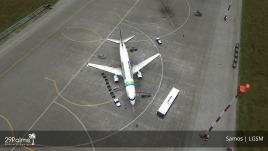 From relevant landmarks, to awesome details - including waterdrains, animated ramp people, flags and what not. The surrounding villages are superbly represented and makes for a perfect visual approach to 09. Now - in my experience - adding a whole lot af things to a scenery is for everyone, but creating it in such a manner, that simmers with medium systems (2600K/970GTX) can crank all eyecandy up and still experience excellent performance, is a true work of art. 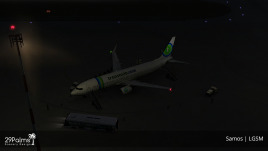 I run my prepar3d with most sliders full right at 3xDSR and 4xAA (autogens at dense), 3 km cloud shadows, and shadows from autogen on, along with FTX global, vector, EU landclass, ASN and get excellent performance in the Aerosoft airbus, even with all scenery items turned on. Simply hard to believe! I had misread the manual regarding the option to disable markings on one of the aprons, so I reached out to the developer via the build in message service in the scenery configurator. Within one hour, I had the pleasure of excellent, friendly and helpful support. Someone commented, that this scenery was a "labor of love", and I must agree that it feel so in every aspect! Just like the other sceneries I own from 29 palms, they set a new standard every time they hit the market. Thank you for taking my money in return for this marvel, and I look forward to future projects. I highly recommend this scenery to everyone! A new level of scenery design! Samos by 29Palms is BY FAR the best looking scenery I have experienced in FSX. I couldn't stop flying over again and again to take it all in. Performance is stellar. This truly raises the bar in high end add on scenery. Do yourself a favor and buy this beautiful piece of art!